A cat at ease, cozily curled or quietly sitting, fairly glows with contentment. These cats sit placidly on your shelf or table, their hearts luminous. 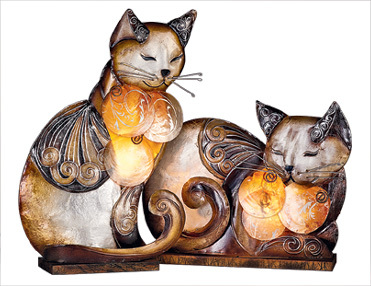 Textured metal cat lamps with cadiz shell for soft, warm light. Each takes one candelabra bulb, included. Sitting Cat Lamp measures 13 1/2" x 9 1/2"; Crouching Cat Light measures 9" x 11". Crouching Cat Lamp, on right, no longer available. I have both these lamps. I love them. I put flickering bulbs in them and leave them on 24 hours a day. They are very unique. Delightful, in fact. This is not a LAMP. It is barely a nightlight. Very little light comes through so it is useless. Cost too high to return so I'm stuck with it. Customer service rude. Owner Response:Thank you for your review, Jane. We're very sorry you're disappointed with this item, and are always happy to assist with an exchange or return if any of our products do not meet your expectations. Please give us a call at 800-207-4256 if we can help. Item very well packed for shipping. Lovely. My daughter loves it. Gift for my sister, don't want to give it up! It's the best, love cats and love the product!! I like the crouching cat so much I will soon be ordering the upright cat. It's charming and gives off a soft warm light. I ordered 2 cat lamps for gifts. As I carefully opened the first, "something" was dropping and pinging all over the floor and back into the box, like pieces of the lamp had flaked or chipped off, but I couldn't see anything. The lamp was very pretty and I was happy enough, but as I suspected (and there is NO information on the items in the catalog as far as materials or what I consider helpful, real info - just cute, fast text. I even wrote in a suggestion to include actual material and detail in descriptions!) the lamp was little more than thin "tin" and what had flaked off all over was very inconsistent, scrolled paintwork that had chipped where it was applied too thickly. Oh well, it was on sale. I plugged it in and again was a bit disappointed to see that the light was a tiny area of 3 round shells on the chest and was NOT at all this warm glow as shown in the photo - very, very misleading. When looking at the lamp all you see is light of the bare, small bulb straight through the bottom shell and some glow around it as it reflects off the rest of the shell area. Again, I suspected as much but this is really almost tacky and an eyesore. I then noticed two of the shells, which are coated with a shiny glaze, were missing chunks of this glaze in large areas. So, the light was tan/white on this part and this stuck out like a sore thumb. I could not, and would not give this as the gift I had intended it to be. It was like a cute lawn ornament someone decided to make a lamp out of and so stuck a hole in it, put some shells on and threw a light in. I opened the 2nd cat lamp and again, more drips and chunks of paint pieces. The wire of the bottom shell, which covers the light itself, was too short to even reach the bottom of the lamp and can't be adjusted since it's welded to the top of the hole. So when turned on you have a bare bulb glaring at you. Solution? Return them, at MY shipping and packing expense, to the company! This would cost me about what the lamps, which had free shipping! cost me. I really should have known better. So, two lamps that can't be given as gifts and which I really don't want or need. And even if perfect were in no way worth the money charged for them, after seeing what they are made of. I also bought 2 of another product and was stunned at how "cheap" that ended up being, too. I buy a lot from catalogs and don't expect wonderous things, but expect the descriptions to be informational, honest, clear, and the photography to not be so deceptive. In fact there was a problem with my credit card when trying to order online - the sale coupon wouldn't be accepted and when I called the girl said she had no idea why it wasn't being taken and to call back the next day (when the coupon was over.) I then got it to work and got a confirmation number - then got a phone call several days later telling me my card had been declined. After the stuff was supposed to already be shipped and I was already waiting. The whole time from start to finish I just had a bad experience with this place. I'll never order again. Owner Response:Thank you for your review, Wrenna! We're so sorry you experienced some issues with the lamps. We're always happy to assist with an exchange or return if any of our products do not meet your expectations; please give us a call at 800-207-4256 if we can help. Always pleased with the order and service given.